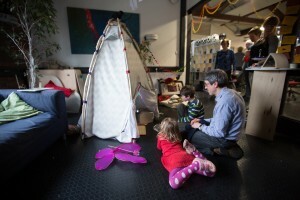 The Teleportation Tent is an immersive story den for children. 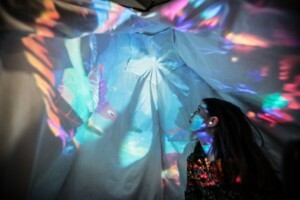 One part DIY game of building, one part imaginative flight of technological fancy; this small self-built teepee comes to life with interactive 360 projections that flood the inside walls. Commissioned as part of the REACT Play Sandbox to explore the challenge of creating interactive story worlds for a child’s bedroom. This was an R&D project funded by the AHRC and made in collaboration with Dr Mandy Rose of the Digital Cultures Research Centre, object designer Tom Metcalfe and creative technologist Lee Nutbean from i-DAT at Plymouth University. The first phase of the research process was finished in February 2015.